As an artist, I am always inspired by the life forces flowing at us from the Universe. As I am a devotee of Ganesha, representing him through various forms sometimes as an icon of inspiration and sometimes as a concept has been my specialty. My canvases have always reflected versatility and sometimes they carry me to an imaginary world where I can successfully merge the modern with the classic with my brush strokes. My emotions are intense and perhaps that is why my canvases carry the signature of expressive abandon and vivaciousness. Prakash Raman was trained in the famed Telecherry School of Art in Kerala. His first solo exhibition was held at the Sea Rock Art Gallery in 1990. He has held more than six solo exhibitions, one of which was in the famous Alexia Studio of London. His group exhibitions have been held at international locations like Abu Dhabi Emirates Palace (2012), Singapore Ion Art Gallery (2012) etc. He has participated in exhibitions held with notable artists in Jahangir Art Gallery, Mumbai and Mystique Stroke, Pune. 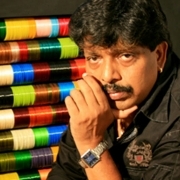 Prakash received the state award for Kerala Youth Festivities in 1974 and best painting award from Artist Center in Mumbai in 1994. He has also authored books on Textile Design and Art.